RingLead is excited to announce the launch of two brand new features to their native Salesforce app, DMS Scanner. DMS Scanner, formerly known as Dupe Dive, is a data diagnostic tool that will help you regain control of your most valuable asset, your data, providing you with data management solutions to fuel employee productivity, grow revenue, produce meaningful engagement, and generate accurate reporting to aid in decision making using clean, standardized and competent data. 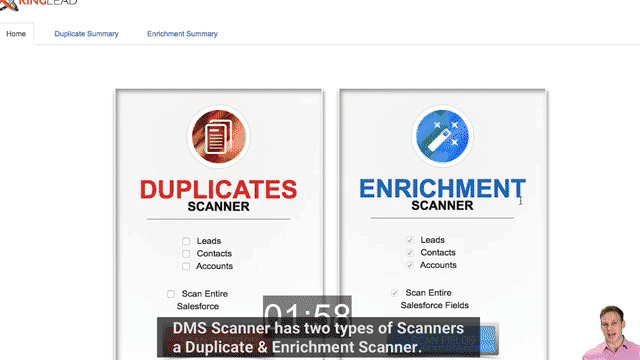 DMS Scanner will now include a revamped duplicate scanner, and a brand new enrichment scanner, to help find duplicate records and missing fields within your Salesforce database in minutes. RingLead DMS Scanner has long been a favorite free app among Salesforce Admins, Marketing Operations, and other professionals responsible for their company’s data quality initiatives because of the accuracy and ease in which DMS Scanner can find duplicate records. With an all-new modern and refreshed look, RingLead DMS Scanner will help you understand the effects of duplicate and missing data, and give you the ability to address these pain points using RingLead Data Management Solutions (DMS). Using RingLead’s sophisticated DMS Scanner’s, you’ll be able to fully understand the considerable impact of duplicate data and missing field values in your Salesforce database through a comprehensive health scorecard that can be made available with the click of button. Our duplicate scanner will reveal the number of duplicates inside your system and the cost of storing those duplicates ($100 for every dupe located), while our enrichment scanner will reveal the number of empty fields you have, and how RingLead DMS Enrichment can potentially help to populate more of your fields. Customize data enrichment based on business strategy for hyper segmentation and intensified Account Based Marketing. Try RingLead DMS Scanner today by clicking the box below to download our FREE scanner now!